There I am, little Trainee Rowe up there in the pink! 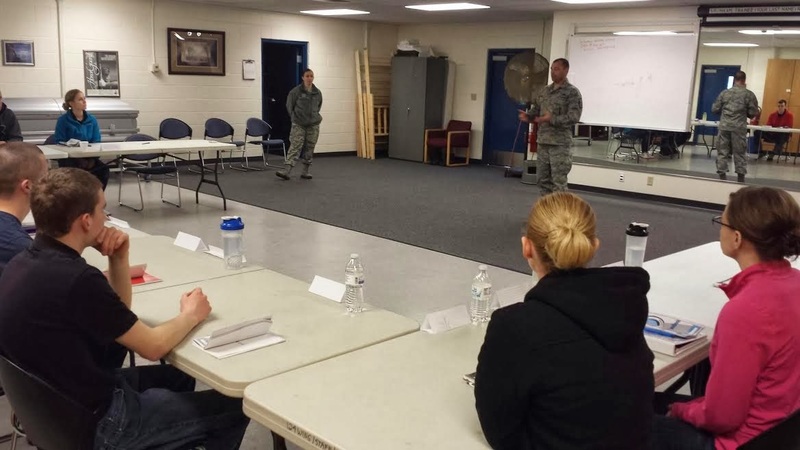 This weekend was my fourth Student Flight during drill weekend for the Air National Guard. Once again, Student Flight gave me new experiences that I will never be able to have after I return from BMT. Each drill weekend has presented so many new lessons, speakers, and activities—and this month's UTA was no different. Saturday, I showed up and began to help the other trainees get ready for the day. Just as we were beginning, one of the recruiters came in and asked for two trainees to come help at an off-base recruiting event. Our superintendent picked me and one other trainee to go experience the "fun in the sun" away from Student Flight for the day. We took it as a great compliment—he wouldn't have chosen us if he didn't think we had our memory work and basics down. The rest of the day was spent standing at a table in Cabela's, talking to veterans and prospective recruits, and honestly—having a grand old time. 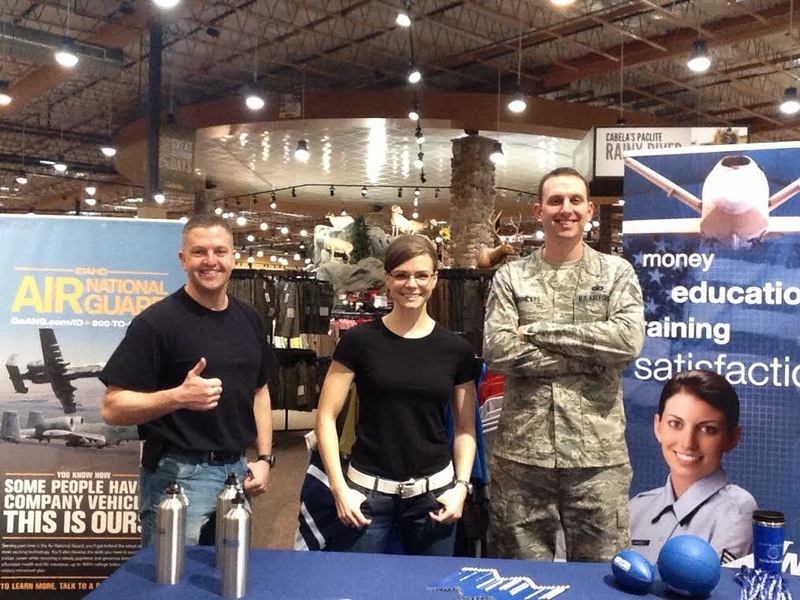 To think—we got paid to chill in Cabela's and talk about the Air Guard all day—it was the easiest money I've made yet! We made it back to the base in time for PT, so not only did we have a super-relaxed day with a recruiter, but we also got to get a good workout in before heading home for the day. If you are in Student Flight and you have the chance to go off-base for an event like this—do it—it's an invaluable experience and not only do you learn about what the recruiters do, but you also get to meet some amazing community members. Sunday also presented a new and interesting experience. We were able to attend a change of command ceremony, which only happens every few years. We stood in formation at parade rest for an hour (which was actually harder than I thought it would be!) and got to watch our first official Air Force ceremony. What an honor! That afternoon, we held a PT test that included the sit-ups, push-ups, pull-ups, and 1.5-mile run that we will have to do down at Basic Training. I ended up with 66 sit-ups, 46 push-ups, a run time of 10:00, and 6 pull-ups. If you remember from my BMT Fitness Standards post, that puts me in the Warhawk category, which is very cool, because I was just barely outside that Warhawk bubble before (I took 53 seconds off my mile time! ), and I've been training hard for it! I only have one more drill weekend before I leave for Basic Military Training, so I'm training harder than ever, maintaining a healthy diet, reciting all the basics over and over, such as ranks, pay grades & insignias, the Air Force Creed, the Air Force Song, and anything else I can think of to get prepped for this amazing experience. If any of my fellow trainees read this post—I just want to say thanks. You guys are so encouraging and it's such a blessing to be able to spend one weekend a month with you. The friendships and bonds we are forming are more valuable to me than anything else—so thank you. I didn't know you were going to basic so soon! Wishing you the best of luck! And yes, if the next month or so is all filled with military-inspired posts, that's probably why. It's kind of non-stop in the back of my brain right now! You guys had drill this past weekend? We have it this weekend! Whoo! Good luck in basic!!! Thanks Dina!! Yep... how funny, we normally are on the same weekends :) Don't worry--I'll be posting until I leave. Can't believe how fast the time has gone :) Talk to you soon! So exciting Aunie! Trainee Rowe is rocking it! I know! Geez it's crazy!